Washington, D.C. | October, 2017 — Kellogg, Hansen, Todd, Figel & Frederick, P.L.L.C. 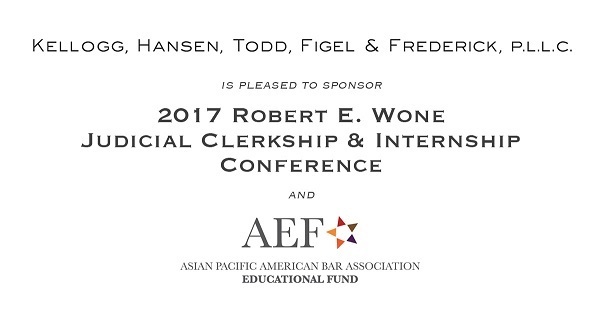 is pleased to sponsor the 2017 Robert E. Wone Judicial Clerkship & Internship Conference organized by Asian Pacific American Bar Association Educational Fund (AEF). Kellogg Hansen strongly supports the Conference’s mission of introducing law students to the value of judicial internships and clerkships. Most attorneys at Kellogg Hansen have served as law clerks to federal judges on the United States Courts of Appeals, and eleven Kellogg Hansen attorneys have clerked for Justices of the United States Supreme Court. Kellogg Hansen applauds AEF’s efforts to provide a diverse group of law students with a better understanding of the application and selection processes for clerkships and internships at all levels of federal and state judiciaries. Kellogg Hansen associate Minsuk Han serves as the Vice President of AEF and is helping to organize this year’s Conference. Minsuk will be speaking at the Conference as a panel moderator. Among those who will participate in this year’s Conference are fourteen federal, state, and administrative judges and hundreds of law students from the Greater Washington, D.C. area. The Conference will take place on October 14, 2017 at the Georgetown University Law Center. For more information and to RSVP, visit AEF’s website here.